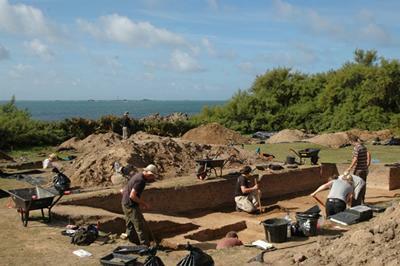 This project aims to investigate changes in settlement, landscape occupation and environment over the course of three millennia in Guernsey (c 5500-2500 BC). In doing so, we also hope to situate the impressive and well-known monumental evidence on the island in its broader landscape context, and to shed light on the initial introduction of Neolithic practices there. The Neolithic of Guernsey is renowned for the impressive number of burial monuments found within its shores. In stark contrast, the settlement record of the same period remains very poorly understood. Across the Channel Islands as a whole, only three potential Neolithic occupation sites have been identified. A proper understanding of settlement practices is vital to our understanding of any archaeological region. In Guernsey, and indeed the Channel Islands more broadly, the archaeological cliché that we know more about the dead than the living is truer than ever. It is therefore critical that we gain a better knowledge of the sites where people lived out their daily lives (see also Scarre 2009). Since the 1970s, seasonal storms have gradually been revealing a Neolithic habitation site on the west coast of Guernsey at L’Erée. Each year, quantities of pottery and flint, along with settlement features such as hearths, are eroded out of the low cliff face onto the beach below. Previous archaeological work on the site has revealed substantial Neolithic/Early Bronze Age artefactual evidence, and Early-Middle Neolithic radiocarbon dates from apparently settlement-related features. Concerned by the continuing loss of this vital site through coastal erosion, and in response to the research interests set out above, we initiated an excavation project at L'Erée in 2008 (financed by the Universty of Liverpool research development fund), building on non-intrusive survey work carried out early in 2008. A team led by Duncan Garrow and Fraser Sturt carried out a small-scale excavation (10 x 5m trench) in September 2008. Our main aim was to find out whether the Neolithic material culture eroding onto the beach was associated with any settlement features. After a lot of heavy digging (the trench was 1.7m deep and no machines were allowed on site as it is a protected nature reserve), we uncovered exciting evidence - along with large quantities of pottery and flint tools, we found a gully and post hole, indicating a possible prehistoric structure. Excavations carried out in September 2009 (funded by the Society of Antiquaries of London) aimed to clarify the nature of this feature, and to characterise the total extent of the site. The linear feature was shown to continue in a straight line, but no further post holes or material culture were associated with it. Its excavated length now exceeds 9m and runs parallel with current and historic boundaries. As such, it is thought likely to be a post-Neolithic field boundary. Test pits dug in the adjacent field proved considerably more interesting. Two distinct buried soil horizons were uncovered. The upper of the two contained large quantities of Late Neolithic/Early Bronze Age pottery and flint, suggesting that occupation in the vicinity must have been substantial. This provides an important landscape context for the contemporary Le Creux ès Faïes passage grave situated 100m upslope. Several settlement features dating to the Early/Middle Neolithic were cut into the lower buried soil. These included well-preserved stone-lined hearths, post-holes, a possible stone wall and a boundary ditch. The latter confirmed the previously-suspected existence of an Early/Middle Neolithic settlement in the area, representing only the second confirmed living site of that period on the island. Excavations carried out in September 2010 (again funded by the Society of Antiquaries of London) aimed to resolve the nature, extent and chronology of this settlement in greater detail. In order to do this, we excavated one large open area (10x5m) around the most promising features from 2009, and four further test pits across the field. As a result, we uncovered a further 16 settlement features (including a ditch, pits, more stone-lined hearths, and post- and stakeholes), and substantial amounts of Neolithic and Early Bronze Age material culture. The features appeared to have been created during two phases of Earlier Neolithic occupation, between 4700 and 4100 BC. Despite the number of post- and stake-holes found, no clear buildings have yet been discerned. It is therefore probable that the site witnessed repeated, camp-like occupation, with the site being returned to intermittently over time rather than occupied permanently. Importantly, close material connections between this settlement and artefacts found in the famous tomb excavated across the island at Les Fouaillages suggest a very close relationship between the two sites: this appears to be a settlement contemporary with the earliest known monument on the island. Given the very large amounts of Chalcolithic/Early Bronze Age pottery and flint recovered from the site, it is in many ways surprising that, as yet, no features clearly associated with this phase of occupation have been recovered. As a result, frustratingly, it is very difficult to say a great deal more about the nature of occupation at L'Erée during this period. Certainly, the amounts of material recovered suggest substantial occupation overall. It is possible that features associated with this occupation have simply not survived; equally, they may never have been present in the first place.